The Center for Community Development and Research, CCODER, is a local apolitical non-governmental organization, run for and by Nepalese. Being an apolitical organization is one key to success in Nepal- with the political crises facing the country, it is imperative to be a voice of the people, for the people. 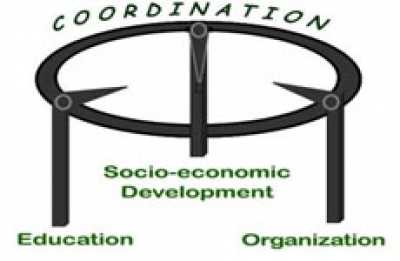 With that said, CCODER’s mission is to empower and mobilize individuals and communities to create their own paths to development and recognize we all are the master of our own destiny.CCODER believes that a holistic approach to development is the key to success and has developed a strategy based on the idea of “Total Human Development”. The idea of Total Human Development comes from putting the promotion of the person, above all else. CCODER’s Total Human Development approach brought forth the Tripod Model which CCODER initiates in communities around Nepal. Through activities, the Center has identified a way to promote the person as a means to development: fulfillment of one’s basic needs, empowerment through education, and creating support systems out of families and neighbors. CCODER works in three main areas to achieve their organization’s goals: Empowering and Mobilizing Communities; Developing Community Development (CD) Packages; Implementing the CD packages. Through the development of Community Development Committees (CDCs) on the local level, then developing and implementing packages for the continual learning and development of the specific community. CCODER aims to create development in Nepal through constant learning and development of tools to be used in the field. It’s main objective is not only to create successful projects and implement these projects, but through communication and collaboration work with communities to develop tools that can help others get out of poverty. Through a handful of project CCODER has seen change- not just an increase in incomes, but change that cannot be calculated; change of persons will, drive to succeed, and participation in their communities and in their own lives. This is why, all activities supported by CCODER are aligned with its Total Human Development Approach and Tripod Model to development.